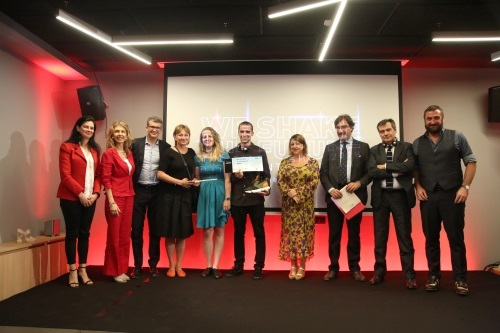 8 proud finalist teams of the European footwear design competition Shake the future of the footwear sector demonstrated their creative and visionary take on the footwear industry at the final award ceremony Talent Shoe 2018, hosted by Assocalzaturifici at Confindustria Moda in Milan. The design contest is part of the various actions to promote the footwear sector among young generations carried out by the social partners Assocalzaturifici, the CEC - European Footwear Confederation, and IndustriAll Europe under the European funded Social project, “Attracting New Skilled Workforce for Quality Jobs in Europe”. Indeed, young people are the key to ensuring the future growth and success of the footwear industry in Europe, and footwear companies are looking for skilled and talented young workers to increase their capacity for innovation and creativity. When tasked with the challenge of envisioning new concepts for footwear designs and imagining what footwear factories might look like in the future, 42 teams of enthusiastic students from across Europe rose to the occasion, proposing ideas ranging from playful models of children’s shoes changing colours to recyclable or connected shoes, underlying wellbeing, sustainability and fashion, which showed an imaginative impulse and understanding of emerging and budding consumers’ trends. The keen and dynamic participation and the talent seen today have equally demonstrated that the footwear sector holds relevant and exciting opportunities for young people interested in producing valuable and fashionable products coveted all over the world. Teaching young people about the varied and valuable footwear professional opportunities and encouraging their enrolment in footwear schools remain a priority to ensure that the skills needs of footwear companies are met in the years to come. Judging by the spirited enthusiasm and creativity generated by the “Shake the future of the footwear sector” contest, the project partners are confident that with continued efforts from all stakeholders to promote the sector, a new generation of avid and talented footwear professionals will manage to refashion European footwear careers and make the sector stronger than ever.